Foldable hitch coupler to realize both trailer and stroller. Our new baby bike trailer is perfect for you to ride a bicycle with your lovely children together. 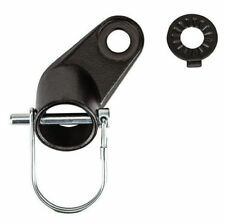 Moreover, it contains an excellent hitch coupler to attach with your bike easily and quickly. BURLEY BEE CHILD TRAILER, BEE YELLOW #946203. NEW IN BOX. Flex connector allows bike to lay flate while trailer remains upright. This entry level, lightweight, bike-only trailer features comfortable seating for one or two children. The front wheel also incorporates a lock out switch so that the front wheel can be fixed into a straight forward direction. Full featured swivel wheel jogger/ stroller for one child. Quickly converts to a swivel wheel jogger, with lockout feature to fix front wheel in place. Fast Shipping!! Blowout price Promise!! Allen Sports CZ2 Cargo Trailer - NEW IN A BOX. Universal coupler attaches to most bicycle rear wheels. Quickly converts from cargo trailer to handy pull car. USA Stock! Premium Quality! Value for money! Features: Foldable frame,easy to store it. It can be attached on the bike Large space for cargo,luggage and more things. Steel frame,super stable and strong. 16" rear wheels design. Perfect for carrying groceries and running routine errands Specifications: . 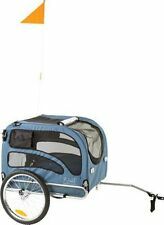 Heavy-duty, water-resistant polyester fabric|Quick release wheels|Dual entry (front and back) design for easy loading of your pet|Sturdy steel frame|Easily assembles and folds down for storage. Specially strengthened solid metal bottom|Quick release wheels|Easily assembles and folds down for storage|One Aosom Type 'A' bicycle hitch/connector included|Including a removable and washable cover. HEAVY DUTY CAPACITY: At 110 lbs., the Aosom Wanderer has the highest carrying capacity in its class, allowing it to handle most any load.|DETACHABLE FRONT AND BACK: The front and back detaches easily allowing for more space and for larger items to be placed onto the trailer.|FOLD DOWN SIDE WALLS: In addition to the front and back, the side walls fold down making it easy to transport large objects.|DURABLE CONSTRUCTION: A sturdy steel frame and a strengthened solid PE bottom offers great peace of mind while out on the road.|BICYCLE HITCH INCLUDED: Includes a simple to use universal hitch that fastens onto your back wheel to allow for quick and easy attaching and removing. Trending at $10.80eBay determines this price through a machine learned model of the product's sale prices within the last 90 days. Even better, accessory kits allow you to easily convert the trailer into a stroller, a jogger, or even a ski-mounted sled. Handlebar adjusts to the perfect height when using the trailer as a stroller (stroller kit required). 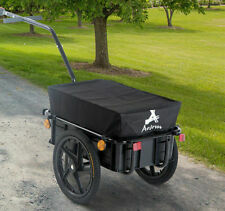 ■ 1 x Foldable Bicycle Trailer. ■ The trailer standing a small flag. Load: 100kgs. ■ Having two yellow reflectors on each wheel. ■ Color: Black. ■ Product Overall Size: approx.72x86x57cm /28”x 33”x 22”(L W H). It's never too early to help your little ones fall in love with cycling. Bring the kids along for a ride to the park, on errands or just around the neighborhood safely and comfortably with the InStep Robin 2-Seater Kids Bike Trailer. Experience engaging, active adventures with the Weehoo® TURBO™ bike trailer. Kids pedal along, making effortless exploration. Safe, interactive, easy to install and all terrain! CARGO STORAGE: 14l. One Aosom type "A" bicycle hitch included. Our product Pet Trailer can satisfy you. It is constructed with 600D oxford nylon, PU waterproof coating material and zippered screen. - Trailer Weight: 30 lbs. 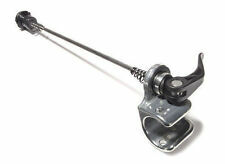 This item is a practical bike trailer hitch for towing solutions. With the complete hitch arm and hitch connector, easy to install without other tools required. Premium steel material ensure high endurance and practical use. Biking is great exercise and a fun and freeing activity whether you go solo or with friends. Introduce your tyke to the joys of cycling with the InStep Robin 2-Seater Kids Bike Trailer, great for bring the kids along for a ride to the park, on errands or just for a spin around the neighborhood. The Dumb Stick Bicycle Kayak Tow Bar allows you to tow your kayak using your bicycle. No expensive bulky kayak trailers. kayak tow bar ,bicycle tow bar, kayak trailer, Dumb Stick. Tow kayak with bike. 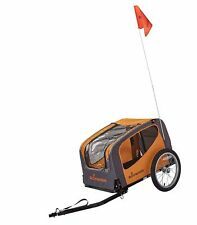 SCHWINN SHUTTLE 2 PASSENGER CHILD FOLDABLE BICYCLE BIKE TRAILER W/WEATHER GUARD. Condition is New. Shipped with UPS Ground. Made of steel, it is very heavy duty. 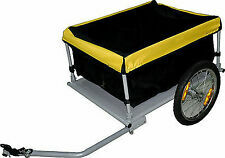 Bicycle Cargo Trailer Yellow and Black. One bicycle hitch/connector included, you do not need anything else to connect the trailer to the bike. Trailer weight 35lbs. Model: Sweet Roll. Steel chassis with lightweight alloy upper cabin roll cage. Universal coupling system to fit all bikes. Dual Venting with Rear Panel. We are not an authorized dealer of this product and any warranty included with the product may not be honored by the manufacturer. SA075 82182. InStep Bicycle Bike Trailer Coupler. AUTHORIZED DISTRIBUTOR for inStep . Angled Elbow. Hitch, Wagons, and Trailers! OFFICIAL . (Beware of Knock-offs). Trending at $14.57eBay determines this price through a machine learned model of the product's sale prices within the last 90 days. Burley Kazoo Childs tandem trailer; single speed. Includes "Moose Rack" for mounting to rack bosses on adults bike. Does not include all the other bikes in the photo! Do the review! The Burley moose rack "stays" are adjusted and cut for each specific bike. Bike trailer coupler, designed for burley bicycle trailers. Painted steel bike trailer coupler for burley trailers. What You Get:1 x Steel Trailer Coupler. Flex Connector not included. No exception. Take your little ones on an outdoor adventure quickly and easily by using this InStep/Schwinn InStep coupler. No more switching couplers back and forth. This InStep/Schwinn Bike Trailer Coupler is ready for use with any InStep/Schwinn trailer that accommodates 2 children. Trending at $7.59eBay determines this price through a machine learned model of the product's sale prices within the last 90 days. Specification: ■ Brand new ■ Color: Black ■ Material: Steel ■ Product Overall Size: approx.72x86x57cm /28”x 33”x 22”(L*W*H) ■ Tow Bar Length: approx. 65cm/25” ■ Capacity Size: approx.72X55X36CM/28”x21”x14” (L*W*H) ■ G.W. : approx.13Kgs ■ Max. Load: 60kgs ■ 1inch=2.54cm Features: ■ Steel foldable frame and 16" quick release wheels ■ Having two yellow reflectors on each wheel ■ Steel rim, steel hub and steel spokes ■ The trailer standing a small flag ■ Stiff plastic floor adds durability ■ Easy to attach brackets. Bike trailers are two- or three-wheel trailers that can be hitched to the back of your bicycle. Some provide seats for young people who want to come along on your biking excursion. On eBay, you can find bicycle trailers in a variety of different sizes and with distinct advantages depending on the desired use. What types of bike trailers are there? Child trailers: These trailers are designed to transport children behind your bike. 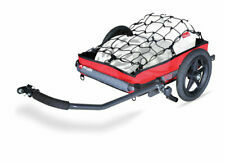 Cargo trailers: These covered, box-like trailers let you haul camping supplies and other gear. Pet trailers: Trailers for pets are designed to secure your dog. They often come with rings to attach a leash. What are the benefits of getting a bicycle trailer? Staying fit: Getting exercise with young kids can be difficult. Attaching a trailer to your bicycle allows you to bring along your children while you get some exercise. Quality time: Bringing a bike trailer when you go for a bike ride allows you to spend quality time with your kids. Bringing supplies: If you are going camping with your bike or you plan to be gone for some time, you can use a cargo trailer to bring extra water, food, or emergency supplies with you. What should you consider when getting a bicycle trailer? 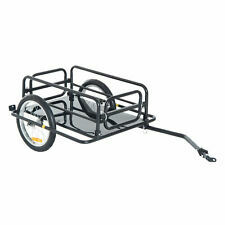 Size: Bike trailers come in several sizes depending on how many children you want to haul. Some are only designed for one child while others can safely fit two children. Design: You'll want to choose a bike trailer that has good suspension and a strong, sturdy frame, especially if you intend to go on trails or slightly uneven terrain. A good suspension keeps the children more comfortable and can help protect them. A rotating hitch is another safety feature to look for in a bike trailer. Handling: If you are an inexperienced cyclist, you may want to go with a smaller trailer. Larger, wider bike trailers are an option for more experienced bike riders. A test drive is a good way to determine if a trailer is the right fit. Wheels: Some bike trailers have two wheels while others have three. If you are hauling a child behind your bicycle, a bike trailer with three wheels provides increased stability. Some other features to consider before choosing a bike trailer include adjustable handles, adjustable sunshades, parking brakes, rain covers, and safety flags. What brands of bike trailers are available?